I’ve had the busiest month since I started as a freelance graphic designer ,and I’ve been really lucky so far as I’ve got to work on some really cool projects. I don’t normally talk about much work stuff on the blog, but one design project I’ve been working on over the past month, is with the lovely guys over at Pirongs Stationery. I got asked to create some illustrations as part of their customisable Planner and Diary range, and it was like the perfect project, as I've always dreamt of having my own stationery range one day, and voila, just like that, I've managed to tick one of my design dreams already off the list thanks to Pirongs. I wanted to share the designs with you, as I know a lot of you have a huge love of stationery like me, and even though apps and digital calendars are great, for me, there’s nothing quite like having a lovely diary IRL to write important dates and adventures in, and even if you’re not the most organised (like me) it helps you at least feel like you are! Pirongs are a family run stationery company, based in Devon and have been making high quality diaries and planners for over 50 years, combining the latest technology and printing techniques. They also specialise in academic and teacher diaries, as well as producing wedding planners and stationery over on Etsy. All Pirongs products are also designed and made in the UK, which I love, and you can create your own stationery products that are completely unique and personal to you, thanks to their nifty online personalisation tool. I got asked to create some planner and diary cover designs, alongside coordinating desk pad designs (which I love btw, I always use these in my office, in replace of a mousemat when I’m working on my Mac, so I can doodle and make notes at the same time as when I’m working in digital). I was super excited to start on these, and equally eager to see the final designs all printed and made up. Inspired by my recent travels to Bali, the illustrations seemed to naturally take a beach and travel theme. (I was mainly designing these when the ‘Beast from the East’ was gracing us with all that snow, so I think I was subconsciously wishing for tropical climes and warm sandy beaches, hence the shells and sunglasses.) I also wanted the designs to have some hand drawn elements, and a sense of playfulness and fun, which is what I'm naturally drawn towards when I'm buying my own stationery. My designs are available in two different ranges The first style is a soft pastel pink, with white shells and hand drawn black polka dots. The second style, is a little bit brighter in colour, consisting of a hand made digital pattern featuring parasols and sunglasses. Both illustration styles come in an A4 or A5 Planner, (£22-£26), an A4 or A5 Diary (£22 - £26, can be personalised) as well as a coordinating A4 paper Desk Pad (£8.40). Love using these as a mouse mat/notepad for doodling designs and making notes about client work. 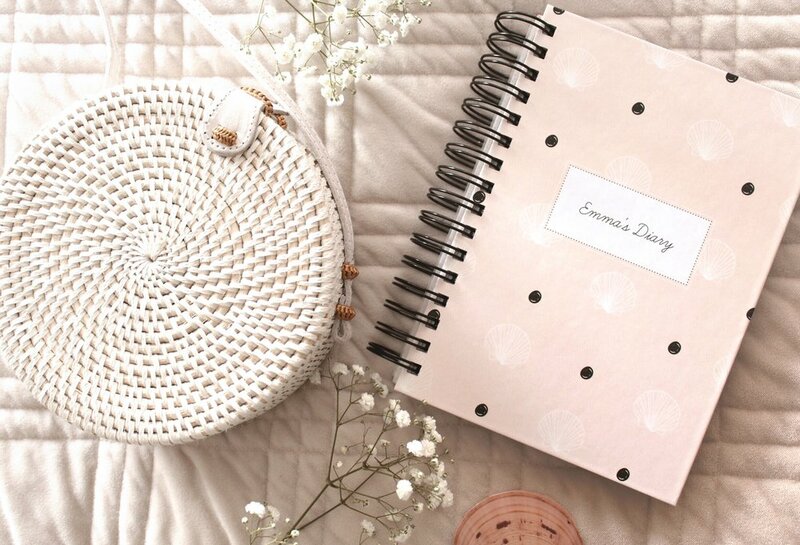 All Unique Planners, diaries and desk pads can be personalized with a name or phrase of your choice, making them the perfect gift for any stationery lover, or even if you just fancy treating yo self. I’d love to know what you look for when you buy a diary or planner, as well as what you think of my designs too, so please feel free to drop me a comment below or say hello over on Instagram. To see my planner and diary designs, and find out more head on over to the Unique Planner shop and choose your style. For the Desk Pad designs click here.